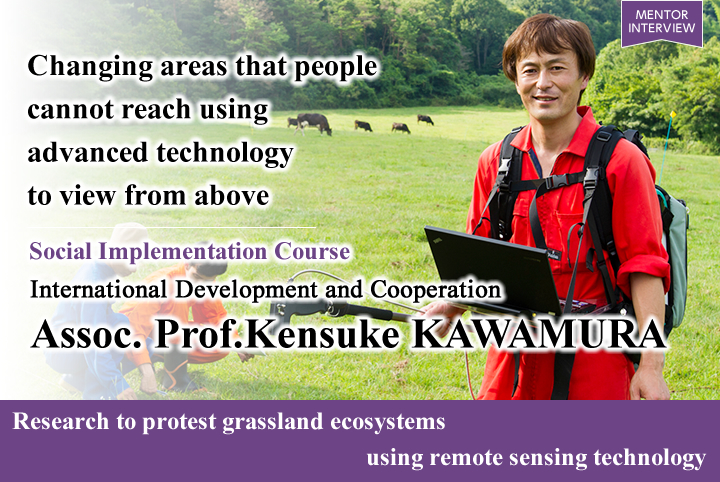 Grassland ecology – this unfamiliar academic field is the area of expertise of Associate Professor Kawamura. There are two types of ‘grassland’: pastures that have developed naturally, such as those in Mongolia, and fields that have been created artificially, such as those in New Zealand and Australia. The common point is that they are both ecosystems that favor herbaceous plants. The aim of this academic field is to preserve the grassland ecosystem environment for both. “In terms of the specific details of my research, for the former grasslands, I look at initiatives to stop the desertification of grasslands in Inner Mongolia, and for the latter, I research productivity improvements and environmental preservation of artificial grasslands”, he says. A special feature of Associate Professor Kawamura’s research is his use of engineering technology known as remote sensing. 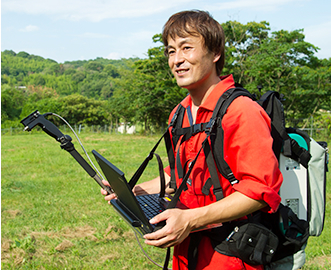 “I use remote sensing technology as a tool to increase the efficiency of the management of grasslands and pastures. To put it simply, the weather report shows how the clouds are moving. That is also the same technology – sensors installed on man-made satellites are observing objects on Earth”. He says that using this technology enables the management of the state of the grass in grasslands, as well as management and assessment of the yield of grass in Inner Mongolia at the regional or national level. “Because it’s used in this way, remote sensing is known as the ‘stalker of the environment’”, he grins. 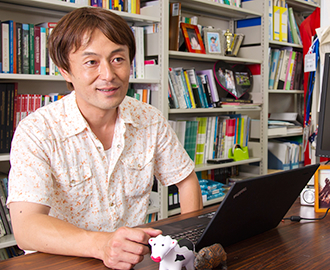 In his research lab, Associate Professor Kawamura applies GPS and GIS (geographical information system) to remote sensing to do things like monitor the behavior of livestock. He has also started an initiative where a 3D sensor is used to investigate the health and growing condition from 3D shapes of the livestock. ‘Grassland Ecology’ is also a subject in the Taoyaka Program curriculum. Associate Professor Kawamura says that he plans to focus the class on remote sensing technology. “This technology is particularly effective for areas that people cannot get to. So in the Taoyaka Program, a major topic will be how to make use of that technology in resource management and environmental preservation in disadvantaged areas”. Naturally, the classes will not only look at remote sensing technology. The students will also gain knowhow on field survey methods and the analysis of ecosystem data, as well as learning about grassland ecology research methods in detail. As this is a compound discipline comprising engineering and biology, he says that the students who take this subject will need to cover material studied by both students in engineering and students in biology. “During the day, the students will go out into the field to collect data, and at night they process and analyze the images they have obtained, and then write a program. It is a full course, with lectures, field work, and practical data analysis”. In terms of the fields that the students travel to, in Japan it is semi-mountainous areas in the Chugoku Region such as Shimane Prefecture, and overseas it will mainly be paddy field regions in Bangladesh. “For example, when going to semi-mountainous areas of the Chugoku Region, flat areas are used for rice paddies, so grasslands are small areas in the remote mountains. Recently cows graze on such grasslands or fields that are no longer cultivated, and remote sensing technology can be used there. That land can be managed just by watching the movement of the cows, and it is a groundbreaking method that does not incur any costs for feed for the cows. I’m thinking of traveling out to locations like that”. Associate Professor Kawamura says that one thing he expects of the students in the program is that they will become specialists. “Crossing over into other fields becomes a strength. And the student then acquires additional skills. The ideal for the students in our program is that they become specialists in remote sensing, and in addition, are able to conduct research on society and culture as well”. He also states clearly that hard work is a must, as the students will have a large amount of interdisciplinary study. “But actually, I don’t think it is hard. There are lots of things to do and to learn, but this is a program that provides an equal amount of support. My policy is ‘work as hard as three people’”, he says, smiling. When asked for his thoughts on the integration of the humanities and science in the program, he replies “I have been continually involved in interdisciplinary activities, but it is the first time I have conducted research with someone from the humanities. Recently, when I speak with teachers from that area, I feel a difference in philosophy. Honestly speaking, it can be a little confusing for me”. Associate Professor Kawamura expresses his expectations: “There may be differences in how we think about things, but as we accept those differences, there should be new discoveries along the way”.